What a great workshop we had on Saturday with Viva. She began with a brief history of the Cnut Hand, which dates from the Cnut Charter of 1018 written by Eadvius Basan. Viva also provided us with copies of some early examples from The Ramsey Psalter and The Arundel Psalter. Edward Johnston thought the hand ‘a good starting point’ for calligraphers today. Not dissimilar to foundational, it’s very legible, easily adaptable and very attractive. Viva had prepared beautiful handouts of the letter groups, which she demonstrated to us at various points throughout the morning. After each demonstration we practised the new group of letters, then progressed to words and short quotes and by lunchtime, we had managed to cover the whole alphabet. 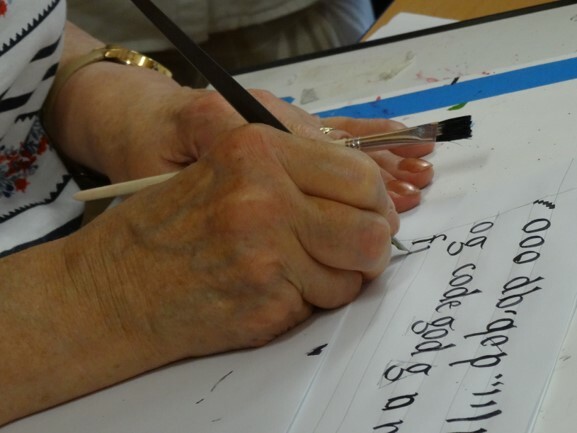 In the afternoon we were encouraged to try the same letter height using a smaller nib size to see the effect and impact of a skeletal letter, and what a difference. This workshop was hugely enjoyable, with a lovely calm atmosphere. You could tell how engaged everyone was by the silence as we practised! Many thanks to Viva for her help, support and advice and a very pleasant day. 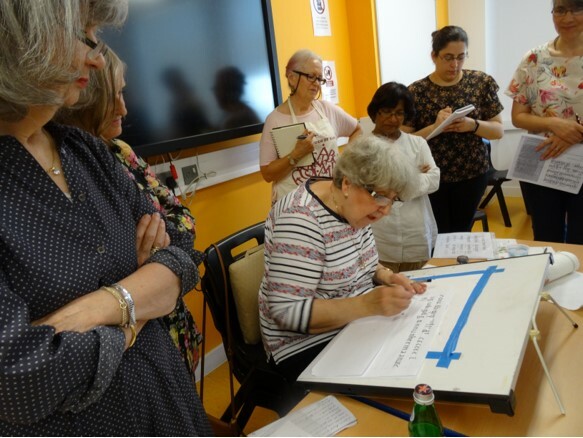 A full report of this workshop by Jenny Howell will appear in the next edition of the Inc.